I got a great comment from Streetfaerie and I think it will be instructive to address it point by point. All quotes are verbatim. Im just finding this blog so I havent read all the posts but are you serious about living in the Stuy and being â€œindependentâ€ of the neighborhood, only venturing to â€œscurryâ€ to the subway? What I’m serious about is that the MYNT is marketed in this way. Consider the website 756myrtle.com. First off the first pictures you see are nice, young, smiling faces. These are the faces you would expect to see inside the MYNT, Bed-Stuy isn’t that white. Click ‘area’ and note the pictures, particularly along the bottom. Starting from the left we have the Pratt Store. It’s ten blocks away and it’s not in Bed-Stuy. Urbanology has three different maps of Bed-Stuy, none of which include the Pratt Store or exclude the MYNT (supposedly located in the Clinton Hill/Bedford-Stuyvesant area of Brooklyn). A brownstone, great, but why just a picture of the windows? Where’s the stoop? What else is missing in this picture? The sidewalk to the subway, a cleverly designed shot which obfuscates peripheral detail due to its size. Home depot! I wonder where the closest Wal-Mart is? And everything you need is offered (or will be) inside the building itself. Laundry, gym, groceries (on the way), ‘public space’, etc. The MYNT is not currently marketed to be a community center, but more of as a club for its tenants. I think this hits at the nerve of contention long time residents have of newcomers and so called gentrification. That’s not so surprising as that is precisely what this blog is about. If you are going to live in this neighborhood then plan on actually becoming a part of it. How offensive that you want to live in our community but see it as some bombed out place that you happened to find a good deal in. People live and love here, its not some â€œroughâ€ or uninhabited place that you happened to stumble upon. I have no doubt that people live and love here, I hope to do the same! No one likes to have the place they live labeled as a ‘rough’ one (remember that I live here too), but unfortunately this conclusion is inescapable for Bed-Stuy. NYPD places it in the top two dangerous neighborhoods along with Harlem even labeling it an “Impact Zone” at least through June of 2006 [wikipedia]. And personally, I was never asked for money in places I have lived previously, but here I have been asked on three separate occasions. This isn’t unique to Bed-Stuy and seems to me to be a part of NYC culture, but there are plenty of places in the city where it just doesn’t happen and in some sense Bed-Stuy is ‘rougher’ than those areas. Therefore I can personally attest that people do live here and hence Bed-Stuy is inhabited, but I do think that it can be justifiably labeled as ‘rough’ in some rough sense. I hope you are able to come to a place where you see your neighbors as people worth getting to know, and the neighborhood as someplace full of culture and history, and understand that you can either be one of the many who only help to drive up property values and price people out with no concern or one of the few that actually try to make a home here. I hope that by the time you read the rest of this blog that you realize the two groups you mention here are not mutually exclusive and that you continue to read and provide your opinions on this subject. 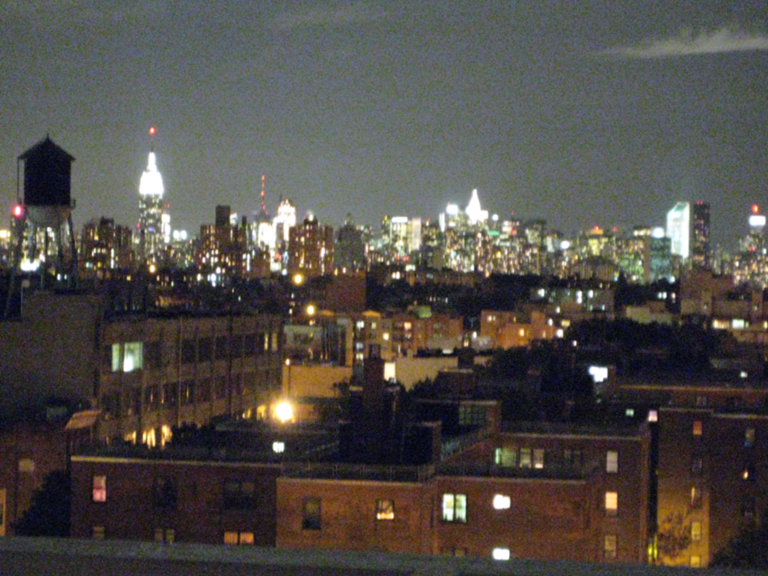 This picture doesn’t do the view justice, but here’s what the view really looks like (as opposed to the rendering). This was written by admin. Posted on Wednesday, October 24, 2007, at 8:35 pm. Filed under Gentrification, Theoretical. Tagged impact, independence, rough. Bookmark the permalink. Follow comments here with the RSS feed. Post a comment or leave a trackback. Er, just checking what you found so confusing about the Home Depot reference. Most New Yorkers would kill to have one nearby. Also, if there’s one thing all Bed-Stuy residents can agree on, it’s that the lines in that place are ridiculous.